As someone who has seen more unsuccessful physical therapy than I care to admit, I am way into injury prevention when it comes to my students. Here are some stretches that I find are really useful and do a lot to ease the wooden, cold feeling of stiff hands. The text refers to the picture(s) above it. Start with your fingertips touching at belly level. 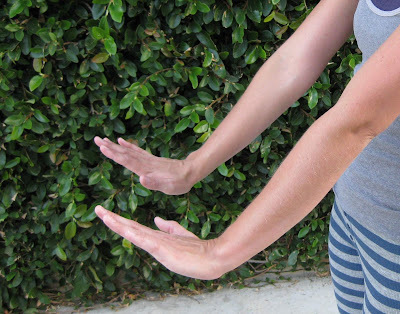 Move your arms down just a few inches and widen the distance between your fingers, just until you feel a substantive stretch. 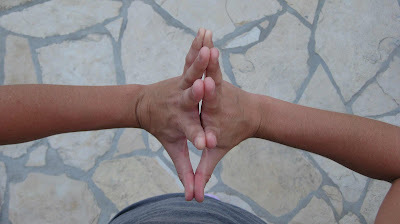 Move in and out of the stretch by raising and lowering your hands slowly. I feel like this clears the cobwebs up in the cartilage across the top of the hands. This is the opposite of the above stretch. Move your arms up to feel the pull. Make sure your shoulders don’t come up in sympathy with your hands. This is one I have been doing since the beginning of time. When I start the sentence, “There is never enough space…” all of my students roll their eyes and finish, “between 1 and 3.” Because there never is. 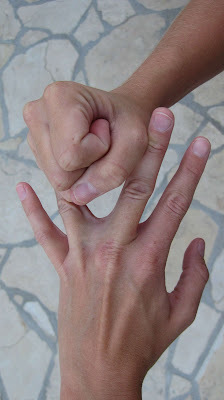 And the real culprit is the tendency of fingers 2 and 3 to stick together, thus contracting the whole hand shape. These two stretches should be approached gradually. Don’t hurt yourself by pushing too hard. This one is straight from BKS Iyengar, the yogi credited with bringing yoga to the western world. It is more advanced than the others, but it brings huge benefits. First take your hands behind your back and touch them together with the palms facing out. Then, moving your thumbs in to touch your back, press your palms together, as best you can. To heighten the stretch, you can gently bow forward. Careful! Careful! If you are recovering from or flirting with tendinitis (hate that spelling, but it’s right) or any strained muscle, avoid this stretch and anything like it unless you get an ok from your doctor. Thank you for the great warm-ups! I tried them today at the beginning of rehearsal when I was holding down the cello section on my own after a long day of work. WOW, this came at the perfect time for me! I’ve been lifting heavy boxes almost every day, and that combined with holding my horn usually puts a strain on my forearms. I used to stretch by holding my arms out straight and gently pulling back on the finger tips with the other hand. I like your stretches MUCH better. Technically, I shouldn’t need to do the one where you were placing a fist between the fingers, but I felt like it might help the independent function of each of my fingers, so I used it today to help with – of all things – a transcription of the finale from Tchaik 4! It helped tremendously. My professor here at UNT calls the euphonium “the brass cello.” I wonder if that’s why your blog (and GREAT comments on mine) keep helping so much? Mike, I sure do. In fact, I have some of my students wrap a rubber band or two around fingers 1-4, and then have them do the Vulcan sign, and then the reverse, which is a long-eared version of the “rock on” Ronnie James Dio thing. 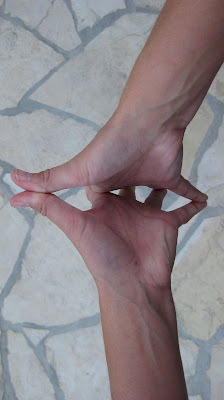 It’s good for strength, flexibility, but most importantly, independence of the fingers. They should go where you want them to go. Later on, you’ll want to be able to smoosh 2 and 3 very close together during Dvorak and Haydn D.
You may at one time develop a second career as a hand model. Ha ha! These gnarled limbs? Up close, they make manicurists cringe with the callouses and ultra short nails.